Catford is a district of south east London, in the London Borough of Lewisham. Catford is notable for having examples of brutalist architecture including Eros House, Milford Towers and Catford Shopping Centre. 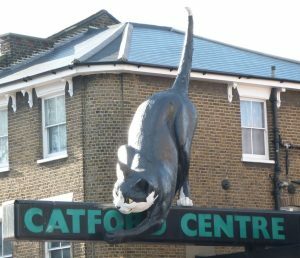 Catford is accessible by car via the A21 and A205. Catford is well served by public transport and has two railway stations: Catford station and Catford Bridge station. Lanes School of Driving has been teaching people to drive since 1914. It has an outstanding reputation amongst the local community. Lanes offers intensive driving courses which are tailored for the needs of our pupils. Theory can be taught either as a separate course or as a part of practical lessons. After pass courses are also offered for those who have passed their driving test. Options include: Pass Plus, Motorway Driving, Parking Skills, and Advanced Driving. At Lanes we offer a flexible approach to learning and instructors can be booked on a weekly basis or just for a single lesson. Discounts are offered for block booking. At Lanes we distinguish ourselves from our competition by offering one on one lessons. We can guarantee that our pupils will not have to share their instructor with another pupil. Our instructors can pick up and drop off pupils from any location for their convenience. Lanes have been providing driving lessons in Catford, London for many years. Please call us today on 020 8166 5678 or click here to send us an email via the contact page. Lanes have a team of over 40 highly experienced driving instructors. Our instructors are skilled in helping nervous drivers of ages from 17 to 70. Pupils can pick the instructor of their choice. All our instructors are DSA registered Approved Driving instructors. Each pupil at Lanes is given their own personal instructor who will stay with them for all their lessons. Lanes have a team of driving instructors in Catford, London. Please call us today on 020 8166 5678 or click here to send us an email via the contact page. Some women pupils can be very nervous and would rather not have a male instructor. At Lanes we offer our pupils the option to chose from one of our many female driving instructors. Our female instructors are very calm and patient. Many female pupils feel more relaxed with our female instructors and learn quicker as a result. Lanes have a selection of female driving instructors in Catford, London. Please call us today on 020 8166 5678 or click hereto send us an email via the contact page. Some pupils express a preference for learning in an automatic car. It is undeniable that manual cars provide a greater degree of control. Nevertheless, automatic cars are less daunting to learn from. They are less complicated, and they will not stall. Pupils often find that they make faster progress with automatic cars. Lanes have a selection of automatic driving instructors in Catford, London. Please call us today on 020 8166 5678 or click here to send us an email via the contact page.